This is a little off the beaten path (BROOKLYN! GASSSPpppp... oh wait, it's actually just one subway stop out so you can shut it) ...but hell, there are free drinks & a free lecture, so that means free fun. 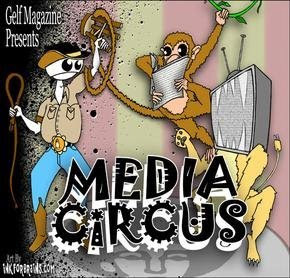 Media Circus returns to Brooklyn on July 9th with a night devoted to the future of journalism school.What is the role of a trade school in an era when everyone is a publisher? Gelf's monthly speaking series on all things media will examine J-school from the eyes of the people closest to it. Jay Rosen, an NYU professor and renowned media blogger (interview here), will be joined by Stephen Shepard, Dean of the CUNY Graduate School of Journalism, and Chris Anderson, not that one, or that one, this one (interview here). The work of local artists will be on display, as well. The event will be held Thursday, July 9, at 7:30 pm (doors open at 7:00 pm) at the JLA Studios art gallery on 63 Pearl St. in the DUMBO neighborhood of Brooklyn—just one subway stop away from Manhattan! Sorry for the last minute notice, but I'm guessing you probably weren't doing anything tonight anyway.